Sumo (相撲, Sumō) is a competition contact sport where two wrestlers or “rikishi” face off in a circular area. The sport is of Japanese origin and is surrounded by ceremony and ritual. The object is to propel the opponent out of a ring about 15 feet (4.6 meters) in diameter, or to force him to touch the ground with any part of his body other than the soles of his feet. The wrestlers wear only loincloths and grip each other by the belt. The Japanese consider Sumo a gendai budō (a modern Japanese martial art), even though the sport has a history spanning many centuries. The Sumo tradition is very ancient, and even today the sport includes many ritual elements, such as the use of salt for purification, from the days when Sumo was used in the Shinto religion. Sumo originated in ancient Japan. Sumo wrestlers are depicted among the earthenware figures surrounding the exterior of some ancient Japanese burial mounds, and in clay figure dolls of the Tumulus period. There are several accounts of Sumo wrestling in the ancient Japanese texts, Kojiki (“Records of Ancient Matters”) and Nihonshoki (“Chronicles of Japan”), especially of the legendary wrestler Nomino Sukune, who is revered as a founder by both Sumo and Judo. Sukune is enshrined as the progenitor of Sumo. Sumo is mentioned in some of the earliest texts in Japan, under its earlier name Sumai, from the eighth century C.E. These early forms of wrestling bear little resemblance to Sumo as it is known today; there were relatively few rules, and unarmed fights to the death were still referred to as "Sumo." In the eighth century, Sumo-sechi was instituted as a national religious service. For four hundred years, until the twelfth century, this Shinto ritual was held at the court every autumn. The Sumo-sechi, ordered by the Emperor, was intended to ensure a bountiful harvest for the nation. Representatives of each province were ordered to participate in the contest at the court, and were required to pay their own travel expenses. The contest was known as Sumai no sechie, or "Sumai Party." The outcome of the harvest was divined through the results of the Sumo competitions. The wrestlers represented the spirits of the water and the cultivated field, which were thought to control the crops. There are numerous Japanese legends about farmers who wrestled with “kappa,” or water sprites. Even today, certain shrines carry out forms of ritual dance where a human ceremonially wrestles with a kami (a Shinto 'spirit' or 'god'). After the twelfth century Sumo almost disappeared, as the decline of the power of the Imperial court and the emergence of the samurai (warrior) class resulted in political instability. The last official Sumo-sechi was held in 1174. Under the shoguns, although public matches were banned, martial forms of the sport were encouraged for the samurai, or military caste. The shogun Minamotono Yoritomo apparently encouraged Sumo wrestling at the beginning of the thirteen century. There are several paintings depicting people enjoying Sumo, fully dressed and without the formal wrestling ring (“dohyo”). It is believed that a ring, defined by more than the area given to the wrestlers by spectators, came into being in the sixteenth century as a result of a tournament organized by the then-principal warlord in Japan, Oda Nobunaga. At this point wrestlers wore loose loincloths, rather than the much stiffer mawashi of today. During the Edo period, wrestlers wore a fringed kesho-mawashi during the bout, whereas today these are worn only during pre-tournament rituals. Most of the rest of the current forms within the sport developed in the early Edo period. Professional Sumo wrestling dates from the revival of public matches during the seventeenth century, just after the beginning of Edo period, and is often referred to as the Japanese national sport. However, the Sumo of this period was called Kanjin-Sumo and matches were held to raise funds for building and repairing shrines and temples. It is said that the first Kanjin-Sumo was performed in 1624 by Akashi Shiganosuke, who was titled the first grand champion, or Yokozuna, in 1632. In 1648 the Tokugawa shogunate prohibited Sumo in Edo (Tokyo) because of suspicions that the Sumo organization had close connections with a group of ronin (unemployed samurai). In 1684 Sumo matches were again permitted under certain conditions imposed by the magistrate. In 1789 Tanikaze and Onogawa were nominated as the second Yokozunas (grand champions). In 1791, Tokugawa Ienari, eleventh shogun of the Tokugawa shogunate, watched Sumo tournaments. Around this period, the legendary Sumo hero Raiden Tamegoro appeared, and Edo Sumo became popular with the general public. Records from the last days of the Tokugawa list matches between Sumo wrestlers and other wrestlers and boxers. In 1854, Matthew Galbraith Perry, Commodore of the U.S. Navy, compelled the opening of Japan to the West with the Convention of Kanagawa. The next year as the treaty was concluded between the two countries, the American sailors were surprised to see Sumo wrestlers easily lift and carry the heavy bags of rice which were a gift from Japan to the United States. 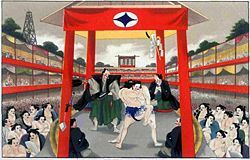 After the Meiji Restoration in 1871, the government began to prohibit nakedness, and Sumo wrestlers were condemned and punished with a fine and whipping. The idea of prohibiting Sumo emerged, but the Emperor Meiji, who enjoyed doing Sumo himself, and the prime minister, Ito Hirobumi, tried to find a solution to the problem. In 1884, Sumo matches were held in the presence of the Emperor, and Sumo was officially authorized. In 1907 Yokozuna Hitachiyama visited America and began the introduction of Sumo to foreign countries. It is worth noting that nations adjacent to Japan, which share many cultural traditions, also feature styles of traditional wrestling that bear resemblance to Sumo. An example is the Mongolian wrestling of Mongolia. The first wrestler to touch the ground with any part of his body other than the soles of his feet loses. The first wrestler to touch the ground outside the circle loses. On rare occasions the referee or judges may award the win to the wrestler who touched the ground first; this happens if both wrestlers touch the ground at more or less the same time and it is decided that the wrestler who touched the ground second had no chance of winning as, due to the superior sumo of his opponent, he was already in an irrecoverable position. In this case, the losing wrestler is referred to as being shini-tai (“dead body”). There are also a number of other rarely used rules that can be used to determine the winner. A wrestler using an illegal technique (or kinjite) automatically loses, as does one whose mawashi (belt) becomes completely undone. A wrestler failing to turn up for his bout (for any reason, including a prior injury) also automatically loses (fusenpai). After the winner is declared, an off-stage gyoji (referee) determines the kimarite (or winning technique) used in the bout, which is then announced to the audience. Matches often last only a few seconds, as usually one wrestler is quickly ousted from the circle or thrown to the ground. However they can occasionally last for several minutes. Each match is preceded by an elaborate ceremonial ritual. The wrestlers themselves are renowned for their great girth, as body mass is often a winning factor in sumo, though with skill, smaller wrestlers can topple far larger opponents. 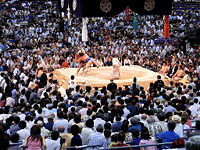 Sumo matches take place in a ring called a dohyō (土俵). The dohyō is made with a mixture of clay and sand spread over the top, and is between 34 and 60 centimeters high. It is removed after each sumo tournament, and in the city of Nagoya, pieces are taken home by the fans as souvenirs. A new dohyō is built prior to each tournament by the yobidashi, who are responsible for this activity. The yobidashi also build the dohyō for training stables and sumo touring events. The circle in which the match takes place is 4.55 meters in diameter and bounded by rice-straw bales called tawara (俵), which are buried in the clay. The rice bales are ⅓ standard size and are partially buried in the clay of the dohyō. Four of the tawara are placed slightly outside the line of the circle. In olden times this was to allow rain to run off the surface, when sumo tournaments were held outdoors in the open. Today a wrestler under pressure at the edge of the ring will often try to move himself around to one of these points to gain leverage in order to push back more effectively against the opponent who is trying to force him out. 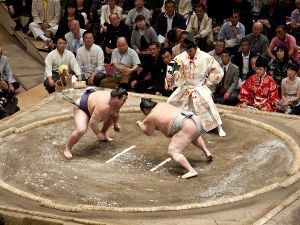 At the center are two white lines, the shikiri-sen (仕切り線), behind which the rikishi must position themselves at the start of the bout. Around the ring is finely brushed sand called the ja-no-me (蛇の目 snake's eye), which can be used to determine if a wrestler has just touched his foot, or another part of his body, outside the ring. The yobidashi ensure it is clean of any previous marks immediately prior to each bout. Sumo wrestlers gather in a circle around the Gyoji (Referee) in a pre-fight ceremony. Modern professional Sumo is organized by the Japan Sumo Association. The members of the association, called oyakata, are all former wrestlers, and are the only people entitled to train new wrestlers. All practicing wrestlers are members of a training stable (heya) run by one of the oyakata, who is the stablemaster for the wrestlers under him. Currently there are 54 training stables for about 700 wrestlers. Sumo wrestling is a strict hierarchy based on sporting merit. The wrestlers are ranked according to a system that dates back hundreds of years, to the Edo period. Wrestlers are promoted or demoted according to their previous performance, and a Banzuke listing the full hierarchy is published two weeks prior to each sumo tournament. There are six divisions in sumo: Makuuchi (fixed at 42 wrestlers), Juryo (fixed at 28 wrestlers), Makushita (fixed at 120 wrestlers), Sandanme (fixed at 200 wrestlers), Jonidan (approximately 230 wrestlers), and Jonokuchi (approximately 80 wrestlers). Wrestlers enter Sumo in the lowest Jonokuchi division and, ability permitting, work their way up to the top Makuuchi division. Only wrestlers in the top two divisions are salaried, and they are called sekitori (to have taken the barrier). Wrestlers in the lower divisions are regarded as being in training and receive a subsistence allowance, in return for which they must perform various chores in their training stable. In some instances, the best recruits out of Japanese universities are allowed to enter sumo with the rank of Makushita, instead of the neophyte Jonokuchi level (see Amateur Sumo, below). The topmost Makuuchi division has a number of ranks within it. The majority of wrestlers are Maegashira and are numbered from one (at the top) down to about 16 or 17. Each rank is further subdivided into East and West, with east being slightly more prestigious. Thus, Maegashira two east is ranked below Maegashira one west and above Maegashira two west. Above the Maegashira are the champion or titleholder ranks, called the Sanyaku. These are, in ascending order, Komusubi, Sekiwake, Ozeki and, at the pinnacle of the ranking system, Yokozuna. Yokozuna, or grand champions, are wrestlers who generally are regularly in competition to win the top division tournament title near the end of a tournament. The criteria for promotion are very strict. In general, an Ozeki must win the championship for two consecutive tournaments (or an equivalent performance) to be promoted to Yokozuna. The rank of Yokozuna is held in 2006 by only one man, Asashoryu. Other recent Yokozuna include Akebono, Musashimaru and the only brothers to have both reached the top rank, Takanohana and Wakanohana III. Yokozuna Chiyonofuji retired in the early 1990s after winning an astonishing 31 tournaments, which is nearly as many as Akebono and Takanohana won together. Once a wrestler has been promoted to Yokozuna, he can never again be subject to demotion and is expected to retire on his own initiative if he cannot perform to Yokozuna standards. There are also special promotion criteria for Ozeki. Usually at least 33 wins are required over three tournaments as a Sekiwake/Komusubi with special attention paid to the most recent tournament record. The final decision always rests with the Sumo Association. All sumo wrestlers take wrestling names called shikona (しこ名), which may or may not be related to their real names. Often wrestlers have little choice in their name, which is given to them by their trainer (or stablemaster), or by a supporter or family member who encouraged them into the sport. This is particularly true of foreign-born wrestlers. A wrestler may change names several times during his sumo career. The current trend is towards more wrestlers, particularly native Japanese, keeping their own name. Professional Sumo is practiced exclusively in Japan, where it originated, but wrestlers of other nationalities participate. The first foreigner to win the top division championship was Takamiyama in the 1970s. He was followed by Konishiki who won the top division title on three occasions, and who was the first foreigner to reach the rank of Ozeki. In 1993 Akebono became the first foreign-born Yokozuna. These three former wrestlers were all born in Hawaii. Former Yokozuna Musashimaru, a Samoan-born Hawaiian, became the second foreigner to reach sumo's top rank in the late 1990s. Yokozuna Asashoryu is Mongolian and is presently (2004-2006) the dominant force in the sport. Asashoryu heads a small group of Mongolian wrestlers who have achieved Sekitori status. Wrestlers from Eastern Europe countries such as Georgia and Russia have also found success in the upper levels of Sumo. In 2005 Kotooshu, from Bulgaria, became the first wrestler of European origin to attain Ozeki ranking. There are currently 59 rikishi officially listed as foreigners. Approximately once every two years the top-ranked wrestlers visit a foreign country to give an exhibition competition. Such exhibitions are also regularly held in Japan. None of these displays are taken into account in determining a wrestler's future rank; rank is determined only by performance in Grand Sumo Tournaments (honbasho). In October 2005, the Sumo Association held an exhibition in Las Vegas. These events are mostly for show and to publicize the sport, as sumo has so far been unable to take root in other countries; however, foreigners have been inspired to try their hand at it in places as far away as Eastern Europe and Argentina. Sumo is not without controversy. One noted controversy has been its exclusion of women participants; there are no women wrestlers or coaches in professional Sumo. More controversially, women are not allowed to enter the ring used by wrestlers, as this is traditionally seen as violating the purity of the dohyō. Those who criticize this continuing policy claim that it is discriminatory. The view of the Sumo Association is that this is a tradition passed down through the centuries. The issue came to a head when Fusae Ota, the female prefectural governor of Osaka repeatedly challenged the Sumo Association's policy by requesting that she be allowed to fulfill the Osaka governor's traditional role of presenting the Governor's Prize to the winner of the Osaka tournament, which would require her to enter the ring. Her requests have thus far (2005) been rejected by the Sumo Federation and she has sent a male counterpart in her place. The sumo hall of Ryogoku in Tokyo during the May, 2001 tournament. There are six Grand Sumo tournaments (honbasho) each year: three at The Sumo Hall (or Ryogoku Kokugika') in Ryogoku, Tokyo (January, May, and September), and one each in Osaka (March), Nagoya (July) and Fukuoka (November). Each tournament begins on a Sunday and runs for 15 days, ending also on a Sunday. Each sekitori wrestler has one match per day, while the lower-ranked rikishi (wrestler) compete in seven bouts, approximately one every two days. Each day is structured so the highest-ranked contestants compete at the end of the day. Thus, wrestling will start in the morning with the Jonokuchi wrestlers and end at around six o'clock in the evening with bouts involving the Yokozuna(s), or the Ozeki(s) in the case of the Yokozuna's absence. The wrestler who wins the most matches over the fifteen days wins the tournament championship. If two rikishi are tied for the top, they wrestle each other and the winner takes the title. Three-way ties for the top position are rare, at least in the top Makuuchi division. In these cases the three wrestle each other in pairs with the first to win two in a row taking the tournament. More complex systems for championship playoffs involving four or more rikishi also exist, but these are usually only seen in determining the winner of one of the lower divisions. The matchups for each day of the tournament are announced a day in advance. They are determined by oyakata (sumo elders) who are members of the judging division of the Japan Sumo Association. As there are many more wrestlers in each division than matchups during the tournament, each wrestler will only compete against a selection of opponents, mostly from the same division. With the exception of the sanyaku wrestlers, the first bouts tend to be between wrestlers who are within a couple of ranks of each other. Afterward the selection of opponents takes into account a wrestler's prior performance. For example in the lower divisions the last matchups often involve undefeated wrestlers competing against each other, even if they are from opposite ends of the division. In the makuuchi division in the last few days, wrestlers with exceptional records will often have matches against much more highly ranked opponents, including sanyaku wrestlers, especially if they are still in the running for the top division championship. Similarly, more highly ranked wrestlers with very poor records may find themselves fighting wrestlers much further down the division. For the Yokozuna and Ozeki, the first week and a half of the tournament tends to be taken up with bouts against the top maegashira, the komusubi and sekiwake, with the bouts between them being concentrated into the last five days or so of the tournament (depending on the number of top-ranked wrestlers competing). It is traditional that on the final day the last three bouts of the tournament are between the top six ranked wrestlers, with the top two competing in the very final matchup, unless injuries during the tournament prevent this. Certain matches cannot occur, unless in a playoff match to decide a championship. Wrestlers who are from the same training stable do not compete against each other, nor do wrestlers who are brothers, even if they join different stables. A Makuuchi rikishi will arrive at the stadium in the afternoon and enter the changing room. There are 'East' and 'West' rooms so competing wrestlers do not meet their opponents of the day prior to the match. The rikishi will change first into his kesho-mawashi, an ornate, embroidered silk 'apron', which he will wear during the ring entering ceremony, or dohyo-iri. There are four dohyo-iri on each day, two for Juryo and two for Makuuchi ranked wrestlers. In each case there is a procession of those in the east changing room and one for those in the west. During the ceremony the rikishi are introduced to the crowd one by one in ascending rank order and form a circle around the ring facing outwards. Once the highest ranked wrestler is introduced they turn inwards and perform a brief ritual before filing off and returning to their changing rooms. Yokozuna have a separate, more elaborate dohyo-iri. Once in the changing room the wrestlers change into their fighting mawashi and await their bouts. The wrestlers reenter the arena two bouts prior to their own and sit down at the side of the ring. When it is their turn they will be called into the ring by a yobidashi and they will mount the dohyo. The referee or gyoji will coordinate the bout. On mounting the dohyo the rikishi performs a number of ritual moves involving leg stomps and clapping whilst facing out towards the audience. He also cleans his mouth out with chikara-mizu or power water. He then throws some salt into the ring to purify it. The rikishi perform another brief ritual when facing each other and then adopt a crouch position to "charge" at each other (called the tachi-ai). The wrestlers do not need to charge on the first occasion but can instead stare and return to their corner. This can happen a number of times (about four, or even more in the case of the highest ranks) until on the last occasion the gyoji informs them they must start the bout. The total length of time for this preparation is around four minutes for all rikishi, but in the lowest divisions the wrestlers are expected to start more or less immediately. At the tachi-ai both rikishi must jump up from the crouch simultaneously at the start of the bout, and the gyoji can restart the bout if this does not occur. Once the bout is complete the gyoji must point his gunbai (war-fan) towards the winning side. The rikishi will return to their starting positions and bow to each other before retiring. A winning rikishi may receive additional prize money in envelopes from the gyoji if the matchup has been sponsored. The gyoji is obliged at the end of the bout, even in bouts too close to call, to immediately designate a preliminary winner. For all matches, there are five shimpan (judges) around the ring who can query the gyojis decision. If this happens they will meet in the centre of the ring to hold a mono-ii (lit: a talk about things). After reaching a consensus they can uphold or reverse the gyojis decision or order a rematch, known as a torinaoshi. Sumo wrestlers, at the Grand Tournament in Nagoya, July 2005. In contrast to the preparation time, bouts are typically very short, usually less than a minute, and often only a few seconds. Extremely rarely a bout can go on for up to four minutes, in which case the gyoji may call a mizu-iri or water break. The wrestlers are carefully separated, have a brief break and then return to the exact position they left off in. It is the gyoji's responsibility to reposition the rikishi. If after four more minutes they are still deadlocked they may have a second break, after which they start from the very beginning. Further deadlock with no end of the bout in sight can lead to a draw, which is an extremely rare result. The last day of the tournament is called senshuraku, which literally means the pleasure of a thousand autumns. This colorful name for the culmination of the tournament is taken from the words of the playwright Zeami Motokiyo and reflects the excitement of the decisive bouts and the celebration of the victor. The Emperor's Cup is presented to the rikishi who wins the top division makuuchi championship. Numerous other (mostly sponsored) prizes are also awarded to him, often elaborate, ornate gifts, such as giant cups, decorative plates, and statuettes. Promotion and demotion are determined by a wrestler's score over the 15 days. The term kachikoshi indicates a record having more wins than losses, as opposed to makekoshi, which indicates more losses than wins. In the Makuuchi division, kachikoshi means a score of 8-7 or better, while makekoshi means a score of 7-8 or worse. A wrestler who achieves kachikoshi will almost always be promoted further up the ladder, the level of promotion being higher for better scores. Similarly, makekoshi almost always results in a demotion. In the sanyaku ranks, simple kachikoshi are often not sufficient to be promoted. Rikishi in this highly competitive subgroup of the highest division may require nine, ten, or even eleven out of fifteen possible wins to gain in rank. There are special rules for Ozeki and Yokozuna promotions. A top division wrestler who is not an Ozeki or Yokozuna and who finishes the tournament with kachikoshi is also eligible to be considered for one of the three sanshō prizes awarded for technique (ginōshō), fighting spirit (kantōshō), and for the defeating the most Yokozuna and Ozeki (shukunshō). Unlike most sports Sumo requires a highly controlled way of life. The Sumo Association can dictate the behavior of its wrestlers in a way that would be commonly associated with life in a commune. For example, in the wake of a serious car accident involving a rikishi, the Association banned wrestlers from driving their own cars. Sumo wrestlers can be identified immediately in public. On entering sumo, the rikishi are expected to grow their hair long to form a topknot, or chonmage, similar to the samurai hairstyles of the Edo Period. They are also expected to wear the chonmage and traditional Japanese dress when in public. The type and quality of the dress depends on the wrestler's rank. Rikishi in Jonidan and below are allowed to wear only a thin cotton robe called a yukata, even in winter. When outside they must wear a form of wooden sandals called geta which make a clip-clop sound as one walks in them. Wrestlers in the Makushita and Sandanme divisions can wear a form of traditional short overcoat over their yukata and are allowed to wear straw sandals, called zori. The sekitori can wear silk robes of their own choice and the quality of the garb is significantly improved. They are also expected to wear a more elaborate form of topknot (called an oichi-o (lit. big ginkgo leaf) on formal occasions. Similar distinctions are made in stable life. The junior rikishi must get up earliest, around 5 A.M., for training, whereas the sekitori may start around 7 A.M. While the sekitori are training the junior rikishi may have chores to do, such as assisting in cooking the lunch, cleaning and preparing the bath, or holding a sekitori's towel for him. The ranking hierarchy determines the order of precedence in bathing after training, and in eating lunch. Rikishi are not normally allowed to eat breakfast and are expected to have a nap after a large lunch. The most common type of lunch served is the traditional "sumo meal" of chankonabe, a simmering stew cooked at table which contains a variety of fish, meat, and vegetables. It is usually eaten with rice and washed down with beer. This regimen of no breakfast, followed by a large lunch and a nap, helps rikishi put on weight so as to compete more effectively. In the afternoon the junior rikishi will again usually have cleaning or other chores to do, while their sekitori counterparts may relax, or deal with work issues related to their fan clubs. Younger rikishi will also attend classes, although their education differs from the typical curriculum of their non-sumo peers. In the evening sekitori may go out with their sponsors, while juniors stay at home in the stable, unless they are to accompany the stablemaster or a sekitori as his manservant (or tsukebito) when he is out (this is normally a more privileged role given to a rikishi who may be nearing sekitori status himself). Becoming a tsukebito (or personal assistant) for a senior member of the stable is a typical chore. A sekitori will have many tsukebito, with the most junior responsible for cleaning and other mundane tasks. Only the most senior tsukebito will accompany the sekitori when he goes out. The sekitori are also given their own room in the stable or, if married, may live in their own apartments, while the junior rikishi sleep in communal dormitories. Thus the world of the Sumo wrestler is split broadly between the junior rikishi, who serve, and the sekitori, who are served. Life is especially harsh for new recruits, to whom the worst jobs are allocated, and there is a high dropout rate at this stage. Wrestlers in the lower divisions, who are considered to be trainees, do not receive a salary, but only a fairly small allowance. In addition to the basic salary, sekitori wrestlers also receive additional bonus income, called mochikyukin, six times a year (once every tournament, or basho) based on the cumulative performance in their career to date. This bonus increases every time that the rikishi scores a kachikoshi (with larger kachikoshi giving larger raises.) Special increases in this bonus are also awarded for winning the Makuuchi championship (with an extra large increase for a "perfect" championship victory with no losses), and also for scoring a kinboshi (an upset of a Yokozuna by a Maegashira.) Sanyaku wrestlers also receive a relatively small additional tournament allowance, depending on their rank, and Yokozuna receive an additional allowance every second tournament, associated with the making of a new yokozuna hawser (rope worn around the waist during ceremonies). There is also prize money for the winner of each divisional championship, which increases from 100,000 yen for a Jonokuchi victory up to 10,000,000 yen for winning the Makuuchi division. For wrestlers in the top division giving an exceptional performance in the eyes of a judging panel there are also three special prizes (the sansho) which are worth 2,000,000 yen each. Individual top division matches can also be sponsored by companies. In such cases the winner of the bout typically receives around 30,000 yen net per sponsor (out of the sponsor’s contribution of 60,000 yen; much of the remainder goes in paying the wrestler's tax on the prize). These bout prizes are called kenshokin. For bouts involving Yokozuna and Ozeki the number of sponsors of the matchup can be quite large, whereas for lower ranked matchups there may be no bout sponsors at all unless one of the wrestlers is particularly popular, or unless a company has a policy of sponsoring all his matchups. No prize money is awarded for a bout decided by a fusensho (forfeit victory). Due to the amount of money changing hands depending on rank, and prize money, there have been many accusations of yaocho (corruption, bout-fixing) in sumo. A 2000 economic study on corruption focused on sumo as a closed system in which to study corruption. The authors of the study found that 70 percent of wrestlers with 7-7 records on the final day of the tournament won. The percentage was found to rise the more times the two wrestlers had met, and decrease when the wrestler was due to retire, or during times when bout-fixing had a large media focus. Tegata of the former Makuuchi wrestler Terao. As with many sports, there is a wide variety of souvenirs and memorabilia that fans may acquire. Fans purchasing box seats or front row seats usually purchase the tickets through so-called tea houses, which provide sumo related items in a package that includes the purchase of the ticket. This sort of memorabilia can also be purchased separately. Plates and cups with sumo-related themes are a common item. One of the more unusual items that can be purchased is the tegata (lit. hand shape) of the wrestlers of whom one is a fan. Tegata consist of a hand print of the wrestler accompanied by his fighting name written in calligraphic style by the wrestler himself. The ink for the handprint itself can be either red or black. Original tegata can be quite expensive, but printed copies of the most popular wrestlers can be obtained very inexpensively. Only wrestlers in the top two Juryo and Makuuchi divisions are permitted to make them. Another popular collectible is a copy of the banzuke for a tournament. A banzuke is a document that has been meticulously handwritten in calligraphic script and lists every wrestler who participates in a tournament in order of rank. Sumo is also an amateur sport in Japan, with participants in college, high school and grade school. In addition to college and school tournaments, there are open amateur tournaments. The sport at this level is stripped of most of the ceremony. The most successful amateur wrestlers in Japan (usually college champions) can be allowed to enter professional sumo at Makushita (third division) rather than from the very bottom of the ladder. 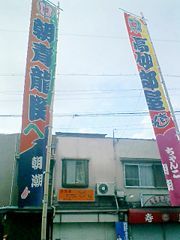 This rank is called Makushita Tsukedashi, and is currently between Makushita 15 and 16. Many of the current Makuuchi rikishi entered professional Sumo by this route. All entry by amateur athletes into the professional ranks is subject to their being young enough (23 or under) to satisfy the entry requirements. There is also an International Sumo Federation, which encourages the sport's development worldwide, including holding international championships. A key aim of the federation is to have Sumo recognized as an Olympic sport. Accordingly, amateur tournaments are divided into weight classes (Men: Lightweight up to 187 lb [85 kg], Middleweight up to 253 lb [115 kg], Heavyweight 253+ lb [115+ kg] and Open Weight [unrestricted entry]), and include competitions for female wrestlers (Lightweight up to 143 lb [65 kg], Middleweight up to 176 lb [80 kg], Heavyweight 176+ lb [80+ kg] and Open Weight). Amateur Sumo clubs are gaining in popularity in the United States, with competitions regularly being held in major cities across the country. The sport has long been popular on the West Coast and in Hawaii, where it has played a part in the festivals of the Japanese ethnic communities. Now, however, athletes come from a variety of ethnic, cultural and sporting backgrounds. In the United States it is not uncommon at festivals and sporting events to have sumo rings set up for entertainment purposes. Generally the participants wear bulky padded suits and helmets fashioned in the shape of Japanese topknots. This is completely unrelated to the sport of amateur sumo, but is quite humorous none the less. Amateur sumo is particularly strong in Europe. Many athletes come to the sport from a background in judo, freestyle wrestling, or other grappling sports such as Sambo. Some Eastern European athletes have been successful enough to be scouted into professional sumo in Japan, much like their Japanese amateur counterparts. The most proficient of these to date is the Bulgarian Kotooshu, the highest ranking foreign wrestler who was formerly an amateur sumo athlete. Sumo, while considered a martial art, diverges from the typical Eastern style both superficially and in principle. Most martial arts award promotions through time and practice; sumo is a pure meritocracy, where ranks can be gained and lost every two months in the official tournaments. In more common Japanese martial arts (such as karate), ranks are awarded after passage of a single test, and practitioners of karate are not normally demoted, even after repeated poor performances at tournaments. This difference from other martial arts creates a high-pressure, high-intensity environment for sumo wrestlers. All the benefits that sekitori wrestlers receive can be taken from them if they fail to maintain a high level of achievement in each official tournament. In many other Eastern martial arts, competitors can display their skill by performing standard routines, called kata, or forms, to receive recognition. Sumo does not provide any recognition of achievement besides the official tournaments. Sumo wrestlers are very specialized fighters who train to win their bouts using good technique, as this is their only means of gaining higher salaries and more privileges in their stables. Another unique aspect of sumo is the brevity of bouts. Many martial arts are fought in rounds or timed sessions, with the winner being determined by a point comparison or the judges' evaluation of technique. Sumo bouts often end very quickly, and therefore require a burst of extreme mental concentration from the initial charge ("tachiai"). ↑ How to Become a Sumo Wrestler. Discovery Channel. Retrieved June 7, 2008. ↑ Daniel Cho, Winning Isn't Everything: Corruption in Sumo Wrestling. UCLA Asia Institute Retrieved November 18, 2005. The World of Sumo. Glossary of terms in English. This page was last modified on 30 October 2017, at 21:13.